The Los Angeles Police Historical Society endeavors to preserve and present the storied history of the Los Angeles Police Department. To accomplish this, the historical society is actually a compilation of programs. Primarily, we operate a museum. But within the museum we also operate a gift shop and maintain a fleet of historic vehicles. The vehicles are lent to various Department entities for station and community functions. In the museum’s meeting room, community groups avail themselves of our meeting facilities, and the museum parking lot is available for community groups to host fund-raising car washes. We also build and maintain the “Wall of Honor” at the museum and the “Walk of Honor” at the Elysian Park Academy. These are the two locations where inscribed memorial bricks can be purchased and installed. Staff and volunteers also make public appearances. These can be as simple as displaying one of our historic vehicles, to more elaborate public speaking appearances. Since the museum frequently appears in movies and television, a fair amount of time is devoted to promoting the facility as a location. This involves meeting with location scouts, set dressers, production designers, etc. Along with that come contract negotiations, and the actual preparation, filming and striking. 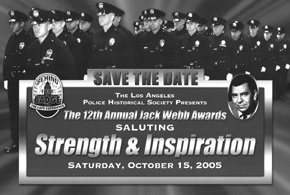 And of course, we are involved in special events, the most notable being, the Jack Webb Awards. This year we are proud to host the awards on October 15, 2005, at the Sheraton Universal hotel. read on. The next couple of pages detail a significant undertaking of two of our distinguished board members, Tom Hays and Art Sjoquist. Images of America, The Los Angeles Police Department is a photographic journey through the history of the Department. See inside for your chance to own it. As this is being written, the museum is experiencing a significant transformation. Headed back in time to the 1940’s, Clint Eastwood’s production company has contracted with us to film a number of interior scenes for his upcoming movie, “Flags of our Fathers.” The movie is based on a bestselling book that tells of the events leading up to the raising of the flag over Iwo Jima. It’s a fascinating story, one that is worth retelling on film. Some stories are worth repeating. 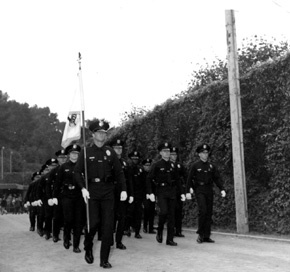 And so it is with our story, the collective history of the Los Angeles Police Department. In 1972 Art Sjoquist, now a retired Captain and a member of the Board of Directors of the historical society, published the history of the Department in his book, aptly titled, “From Posses to Professionals, the History of the Los Angeles Police Department.” This story was retold by Sjoquist in the 1984 Commemorative Yearbook put together and published by the Los Angeles Police Revolver and Athletic Club. This time around, another distinguished and retired commanding officer, Tom Hays, collaborated with Sjoquist to bring the history of the Department to pictures. After months of painstaking work in the historical society’s photo archives, Hays and Sjoquist assembled a collection of photographs for, “Images of America, the Los Angeles Police Department.” Following the foreward by Chief Bratton, the reader is taken on a lighthearted journey through the eras of the Police Department. The pages contain many neverbefore published photos from the historical society’s collection. More than twohundred photographs, illustrate the evolution of the Department from our first six wild-west lawmen in 1869 to the modern day police officer. For both of the retired captains, the book was a labor of love. For the historical society it is another proud offering we are making available for $19.99 plus shipping and handling. We expect the book to arrive in mid-October, and are now accepting pre-sale orders via telephone and through the use of the form on the following page. This promises to be a great addition to any book collection, and certainly promises to be a fine holiday gift. Author’s note: Apologies to Nan Allomong for the misspelling!